It is a truth universally acknowledged, that a billionaire in possession of a good fortune, must be in want of a country house. Or so it used to be. The annual Sunday Times Rich List (£) is always a fascinating insight into the upper reaches of wealth, but the nature of where and how the richest choose to live has changed significantly since the list was started in 1989. Until the 1990s, it wasn’t unusual for those on the rich list to be following a lifestyle that a Victorian plutocrat would have recognised; London townhouse, country house with estate, and possibly another in Scotland. Today, the more international nature of the wealthiest has changed where they live – and increasingly it seems they don’t need the advantages that an estate once brought. 1/ The Hinduja brothers (£11.9bn) – although they top the list, the family favour cities, with homes in London, Geneva, Mumbai, and reputedly, Cannes and Tehran. 2/ Alisher Usmanov (£10.65bn) – surprisingly, considering the limitless opportunities afforded to his peers in this list, Sutton Place, Surrey, is the only country house (as we would understand it) which can be included. It is certainly one of the most interesting. Built in 1524, it displays some of the earliest use of Italian Renaissance design details in the country, which has naturally led to a grade-I listing. The house was originally built around a courtyard but the north wing was demolished in 1782, opening up a rather striking view of the internal entrance front which features a series of terracotta mouldings which give a suggestion as to how the long-lost Nonsuch Palace may once have looked. Sutton Place and the surrounding 700-acre estate was owned by the Duke of Sutherland until 1959 when it was bought by the reclusive oil billionaire John Paul Getty for $840,000 (now equivalent to about $7m) who filled it with his remarkable art collection. Getty lived there in high-security seclusion for the last 25 years of his life before it was sold, after his death in 1976, to Stanley J Seegar, another American art collector for £8m, who notably lured the famous garden designer Sir Geoffrey Jellicoe out of retirement to work on the gardens (video). Seegar sold up in 1986 to the American industrialist Frederick Koch, who again used it as a showcase for his art collection, but this time to the public. He sold it in 1999 for £32m to an unknown party who put it on the market again in 2003 for £25m. Not finding a buyer, the estate was reduced to 300-acres and was bought by Alisher Usmanov in 2004 for £10m. 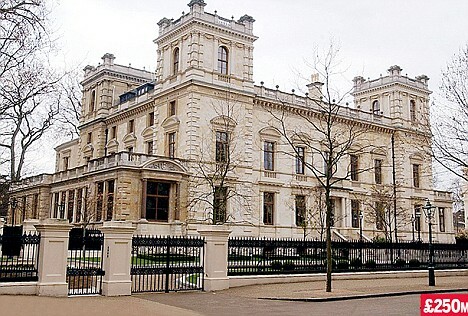 3/ Lakshmi Mittal and family (£10.25bn) – a global metals magnate whose main home is in a city, in this case, London, and specifically, a huge Victorian Italianate mansion in Kensington Palace Gardens. Sadly, though, no country estate – though he was linked at one point with the bravely modern Alderbrook Park in Surrey. 4/ Leonard Blavatnik (£10bn) – a man with diversified interests including oil, gas, and pop music, but it seems that one of them isn’t in owning a country house, though he does have a sumptuous mansion in Kensington Palace Gardens. 5/ Ernesto and Kirsty Bertarelli (£9.75bn) – an Italian who married a lady from Staffordshire but who choose to live in London or on the shores of Lake Geneva in Switzerland. 6/ John Frederiksen and family (£9.25bn) – the current ‘Tanker-King’ of the world, Frederiksen lives in the ‘Old Rectory’ in Chelsea, for which Roman Abramovich (q.v.) once reputedly offered him £180m for – and which he turned down. He also owns homes in Cyprus and Florida. 7/ David and Simon Reuben (£9bn) – although the brothers own a lot of real estate, including Cambridge House, once Lord Palmerston’s London home then later the ‘In and Out Club’ (or ‘Naval and Military Club’ for its official name), they don’t live in a country estate. That said, they do own one very important country house, Piercefield, as part of Chepstow racecourse, which to their shame, they have let fall into an even deeper state of dereliction and have ignored various attempts for it to be bought so that it might be restored. 8/ Kirsten and Jörn Rausing (£8.8bn) – another couple whose main home is in London but Kirsten’s passion for horse-racing has led to the purchase of nearly 1,000-acres around Newmarket, primarily around her Lanwades stud. This estate used to be centred around the red-bricked Lanwades Hall, which was built in 1907 using the winnings of a bet placed on the 1898 Derby, but was donated to the Animal Health Trust in 1948 with 140 acres, with a new Lanwades House built in 1931 for the stud. 9/ Roman Abramovich (£8.52bn) – although Mr Abramovich seems to be working through a checklist of ‘Things Every Billionaire Should Own’ including five yachts (including the world’s biggest), a jumbo jet, and an art collection, his property has also spanned the globe. However, his portfolio of houses – which includes homes in London, St Barts, New York, Cap d’Antibes, Moscow, and Colorado – now doesn’t include a country house after giving his now ex-wife Irina the 420-acre Fyning Hill estate in Sussex as part of his £1bn-2bn divorce settlement in 2007. Perhaps the seclusion was her preference as he hasn’t bought a replacement and instead has concentrated on London, having also bought in Kensington Palace Gardens. 10/ The Duke of Westminster (£8.5bn) – finally, a proper country house. Sort of. The first notable Eaton Hall was designed by William Samwell and built in 1664 but was replaced by a vast Gothic creation by William Porden in 1803, which was then enlarged by William Burn in 1845. This was then replaced by the Victorian Gothic of Alfred Waterhouse in 1870, before the whole edifice was swept away in 1961 as the trustees of the then young Duke couldn’t imagine anyone living in such splendour again. Faced with being a Duke with no seat in his 11,500-acre estate in Cheshire, in 1971 the 5th Duke commissioned a starkly white modernist country house from John Dennys, (who also happened to be the Dukes’ brother-in-law) which was as striking as it was controversial. This was then given a vaguely ‘chateau’ style makeover in 1989 for the 6th Duke, to designs by the Percy Thomas Partnership. So of the five major houses which have been graced with the name Eaton Hall, the current one, though impressive, still doesn’t quite have the gravitas of the others. Perhaps, in time, a future Duke may decide to replace it again. So, out of the UK 2014 Top Ten, only two are living in ‘proper’ country houses with estates. It’s a bit disappointing really, especially when compared with the first rich list in 1989…which is something to be covered in a future article. In the meantime, we’ll have to hope that our resident billionaires decide to step up and live the role their wealth affords – it’s not as if there is a shortage of fine country houses for sale. If you know that one of the above billionaires does actually have a country house/estate (particularly in the UK, but also abroad), then please do add a comment below or, if you’d like to stay anonymous, email me. This entry was posted in News and tagged alderbrook park, eaton hall, lanwades hall, piercefield, sunday times rich list, sutton place. Bookmark the permalink. Not top 10 but James dyson has a nice pile. I really like the Austen reference in the opening! I would have loved to see Nonsuch Palace looked like. These properties are pretty amazing. It is so hard to buy the average property now with increasing house prices and little supply. These properties are something of a dream unfortunately. I think more people are choosing to live in the capital for a reason. So many wealthy billionaires from abroad are also vying for properties in London.